The Murdock fire made a run to the north in the Duchesne River Drainage the afternoon of Sept. 29. It is a half mile from Blythe Lake, located in the High Uintas Wilderness. 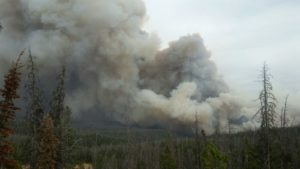 Due to a large column of smoke near Highway 150 (Mirror Lake Highway), the highway is now open to through traffic only. To protect firefighters and other drivers, please avoid stopping along the Highway from Bald Mountain Pass to Highline Trailhead. Firefighters are working with the local sheriff offices to determine if and when the highway may need to be closed A closure may occur as soon as Sunday.